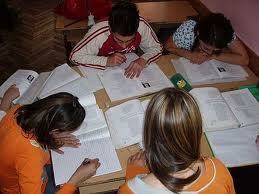 Study groups are a significant part of education and learning when you get to a college level. In high school, they may be more social than academic. In graduate school they may be nonexistent (doctorate programs) as people focus on individual research, or they may be the only form of studying (law school) as there is so much information to learn. Either way, in college, you are in the middle and will use study groups to their strengths. Study groups may be your saving grace in college classes. They may be forced, required, or simply desired in such a highly competitive academic setting. Regardless of whether they are for math, English, history, or science, here are some tips on how to form a study group in college. Listen to people chatting before and after class so that you do not fall out of contact with your fellow students. If you are never around, then you will never be asked to be a part of a study group. If some people are forming study groups already, kindly ask one person if you could join his or her group. Tell that person (or group) of your strengths. Discuss what you will bring to the group. Like job interviews and admissions essays, you will want to show what you can bring to the table, and not necessarily only what the group can do for you. When part of a group, do not be shy. Always suggest places to meet and times to meet. Come prepared! Come to the group with a mini-plan and information. Do not wait until all groups are already formed. There may be no space left for you. Remember, people can sometimes be catty and exclusive. Do not form study groups with close friends. Do form study groups with people you admire and respect. Do select neutral meeting places for your study group to meet. Do not bring too much food to the study group. You will end up eating and socializing instead of studying and learning. Do not make a study group too large. Five people make the best size for a study group. Too many people will turn into a social gathering more than a study group. Good luck studying. Study groups can save you when you feel overwhelmed with information to learn. They can also be your downfall if you are caught in too large a group socializing. It is important to pick your group wisely.